Kuwaiti officials join Louis Berger and Pace team at the award ceremony. Kuwait’s Public Authority for Roads & Transportation (PART) said one of its major projects, Jahra Road and Jamal Abdul Nasser Street Development, has won the Global Road Achievement Award at the International Road Federation (IRF) awards ceremony held in the US. 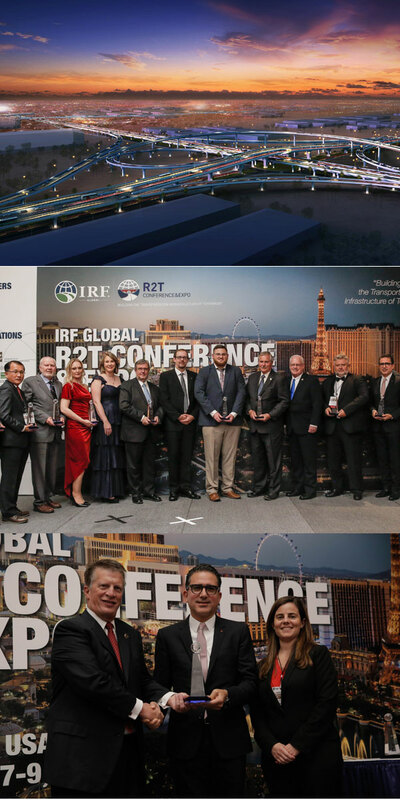 The awards were announced at the IRF Global Road Conference & Road2Tunnel Expo in Las Vegas as part of its ongoing efforts to showcase global industry excellence. The IRF competition is one-of-its-kind held to recognise innovative road projects and exemplary people that place the road industry at the forefront of worldwide social and economic development. The Jahra Road and Jamal Abdul Nasser Street Development project - an ambitious project of PART worth over $1.5 billion aimed at transforming two existing vital arteries into internationally standardised multileveled expressways - has won several regional awards over the past three years. In order to implement this massive undertaking which runs 10 to 11 km long, with the highest quality, PART has collaborated with a joint venture between Louis Berger and Pace – one of the leading multidisciplinary firms in the region, with a reputation for international design excellence. The IRF’s award is Kuwait’s first international accolade for transport infrastructure development, recognizing the project for best program management, said the statement from PART. Represented by a local government institute, and a local consultancy firm, Kuwait was the only Arab country to win the award this year, competing with projects submitted from all across Europe, North America, Australia and East Asia, it stated. On the global achievement, Pace CEO Tarek Shuaib said: "Capitalising on over 50 years of experience in this practice, we are very proud now to see it yield such impressive results, earning us this international award for program management for one of our most important projects." "Winning an award of this calibre is most certainly a valued recognition for Kuwait, rewarding its on-going efforts to enhance its infrastructure with international standards. This also reflects highly upon the quality of our work and our practice in the region," remarked Shuaib, who is also an expert architect. "As a Kuwaiti firm, acquiring the IRF’s Global Road Achievement Award for one projects puts us justly in the big leagues, as we continue to expand our presence on an international scale, delivering high-end unique projects with the highest international quality standards," he stated. Shuaib pointed out that through its successful partnership with PART and Louis Berger, the company had managed to see this mega project become a reality on the ground, and achieve its goals in improving mobility and meet future traffic demands.